Add the first 7 ingredients to a blender, putting the lid on the blender afterwards and blending them until smooth (we added some kosher salt to taste afterwards to bring out the flavors more). Take a 3 ½- to 4-quart slow cooker out and place the beef inside of it. Pour the pepper mixture over the meat, putting the lid on the slow cooker afterwards. Let the beef cook on LOW for 8 to 10 hours or on HIGH for 4 to 5 hours (we cooked ours on HIGH). Take the meat out of the slow cooker using a slotted spoon. Once all the meat’s out of the slow cooker, skim the fat from the cooking liquid. Place the meat on tortillas (we shredded our meat some to make it more bite-size), drizzling the meat with cooking liquid afterwards. Place the toppings on afterwards and enjoy ! *Habaneros are spicy peppers so make sure to wear plastic or rubber gloves when handling them. We were excited to see how spicy these would turn out based off the title and the heat wasn’t as bad as we thought it would be ! We really didn’t get much heat from the beef but the sauce definitely had more heat to it and left your lips with a nice tingle on them and a warmth in your mouth. Sauce or no sauce, we thought the tacos were delicious though ! 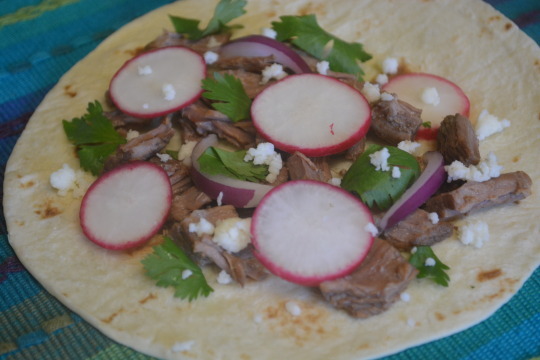 The red onion, radishes and cilantro brought a nice freshness to the taco. The red onion and radish slices brought a nice crunchy texture to the dish that would otherwise be lacking. The Cotija cheese brought a wonderful “funk” that also helped temper the heat from the taco as well. 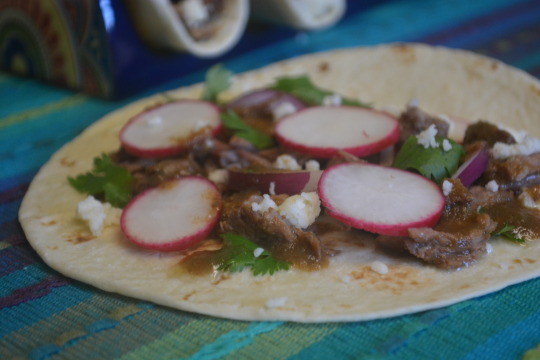 We hope this can be a new favorite taco recipe for y’all ! This recipe came from Better Homes & Gardens. 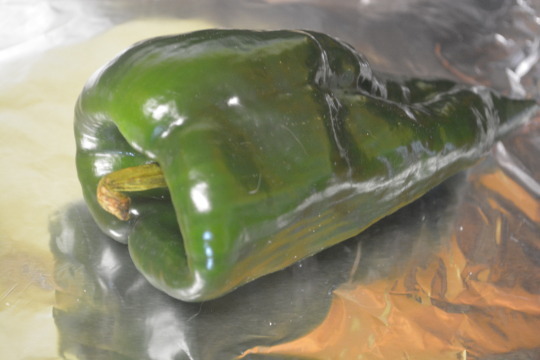 Take the poblanos and place them over the open flames of a gas stove, turning occasionally until the skin is blistered and looks lightly charred. If you don’t have a gas stove like us, then preheat your broiler and take a baking sheet out and line it with aluminum foil. 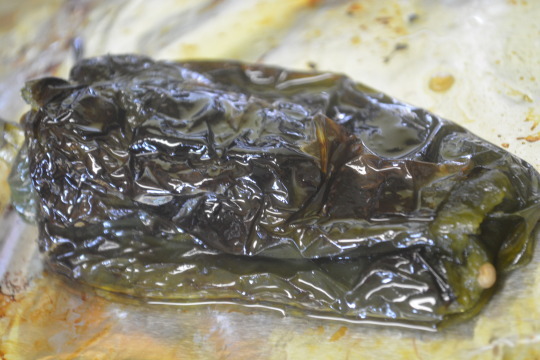 Coat the poblanos with oil (not the 2 tablespoons mentioned in the ingredients list) and place them on the lined baking sheet. Stick the sheet under the broiler (on the first rack above the middle one) and cook until they look blistered, turning the poblanos occasionally with tongs. 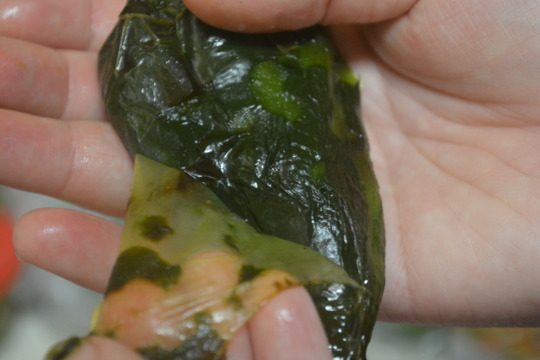 Take the chiles and place them in food-storage plastic bags for around 10 minutes so their skins loosen up. You can take the skin off by simply running your hands down the chile and peeling the skin off. Cut a vertical slit into one side of the chile, opening it up one side, carefully removing the seeds and stems afterwards. Take the lid off your blender and place the poblanos, cilantro, 2 cups of the chicken broth and the bouillon granules into it. Put the lid back on and blend for 45 seconds or until smooth. Strain the mixture, throwing away solids (we pureed ours so we had no solids to throw away). 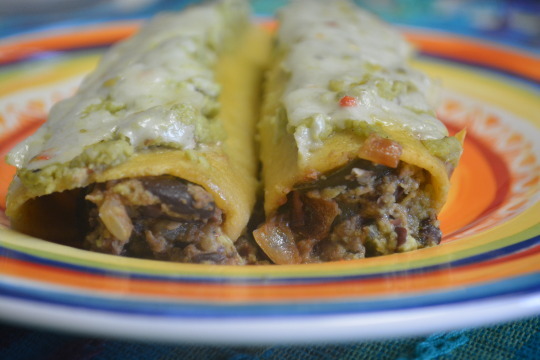 Leave the poblano sauce off to the side for now. Take a 12-inch skillet out and pour the olive oil in, setting the heat to medium-high. Once the oil’s hot, toss in the onion and garlic, stirring constantly for one minute. 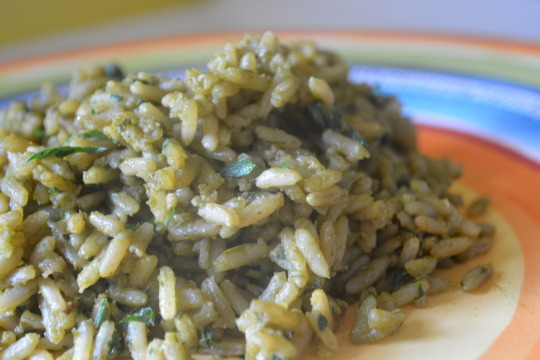 Add the rice into the skillet, stirring now and then for 5 minutes or until the rice looks lightly golden. Stir in the poblano sauce, followed by the remaining chicken broth, half of the parsley and the salt (if you’re adding salt that is). Turn the heat down to low and put the lid on the skillet, cooking for anywhere between 20 to 25 minutes or until the rice is almost tender. Mix in the remaining parsley at this point. Turn the heat up to medium, taking the lid off afterwards. Cook for an additional 3 minutes or until any liquid in the skillet’s been absorbed. Take a bite of the rice and see if you need to add any additional salt (we did). Let it stand for 5 minutes before digging in. 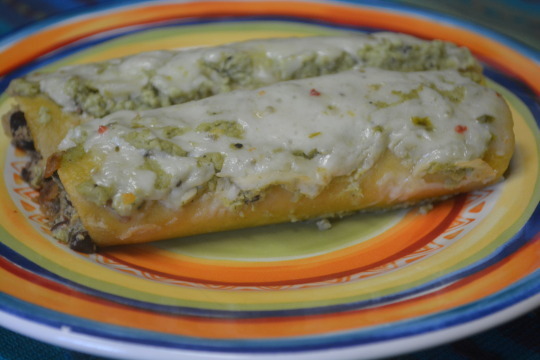 This recipe does take a bit of work but the flavor is so worth it !